The best fiber supplement should be clinically proven to deliver on its claims. After speaking with dietitians and nutritional researchers and reviewing the scientific literature, one type of fiber came out on top: psyllium fiber. Our top picks — two psyllium powders and one capsule — keep additives to a minimum, were more palatable than other formulas, and have ample research to support their benefits. As we dug into clinical studies, we found that if you want a source of fiber proven to deliver on all of the above promises, you have only one real option: psyllium fiber, which comes from a small plant whose seed and husk are ground into powder. According to nutritional researcher Dr. John McRorie, psyllium stands out because of what happens when it’s mixed with water: It gels, and stays gel-like even as it passes through your body. Many fiber sources like inulin or wheat dextrin don’t gel, or gel but lose their stickiness as they travel through the intestines. Instead, these fibers ferment, which causes much of the bloating and flatulence for which fiber is notorious. In other words, psyllium is best because it’s an all-around digestive normalizer that reduces cholesterol, increases satiety, and regulates blood sugar. While we started with 134 supplements, sticking with psyllium left us with 29, many of which were variants from the same brand. So we selected one to two products from each brand, giving priority to formulas with as much fiber and as few additives as possible. We cut a couple of brands entirely, including Hydrocil, whose Instant Dietary Fiber Supplement contained polyethylene glycol, an unnecessary laxative, and Nature’s Way Psyllium Husk, whose capsules had such a low amount of fiber that we would’ve needed to take a whopping 30 pills a day to hit the 10-gram supplemental serving commonly recommended by fiber research. We mixed, stirred, and tasted our way through 13 finalists: 10 powders and three capsules, looking for formulas that were easy to measure and free of off-putting odors, textures, smells, and flavors. The powders all had to be mixed with some type of liquid (we used water), and a few were dismissed entirely by testers at this point. After testing all 13 products, we feel safe in saying fiber supplements just aren’t palatable: the same gelling capabilities that allow psyllium to do its work mean that no one’s going to drink Metamucil for fun. But our top picks stood out as being easier to swallow than average. This straightforward, one-ingredient supplement supports satiety, heart health, blood sugar regulation, and offers digestive benefits. Inside the plastic jar, you’ll find finely ground psyllium husk, a fluffy brown powder that testers said smelled like “oatmeal” and “hay.” There’s nothing else on the ingredient list: no fillers, no additives — just pure psyllium powder. Better still, one teaspoon delivers an impressive 4.5 grams of fiber. Once mixed with water, the powder immediately begins to gel — and becomes more viscous the longer it sits. After three minutes, the texture reminded us of runny applesauce, and our main takeaway post-testing was that you should drink it quickly. Yerba Prima’s applesauce-like texture (left) was more appealing to us than the thicker, grainier texture of other contenders, like Species Fiberlyze (right). Yerba Prima doesn’t taste like much — a good thing when it comes to fiber supplements. It has faintly herbal undertones that none of our testers took issue with. Like most psyllium powders, you can also mix it with more than just water. 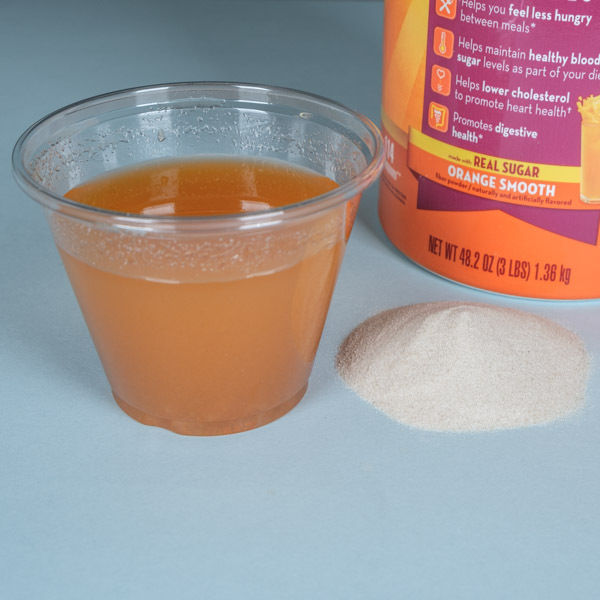 The packaging suggests trying juice, milk, soy, or rice drink, and we could also see psyllium powder being an easy addition to a smoothie. Even though Yerba Prima has a better texture than its competitors, the applesauce texture still isn’t the most pleasant experience. We admit this is nitpicking when you consider the unbearably thick texture of other contenders. But we recommend mixing Yerba Prima in a smoothie where the slightly grainy texture won’t feel as strange. A flavored powder that reminded us pleasantly of an orange smoothie but contains a lot of sugar. 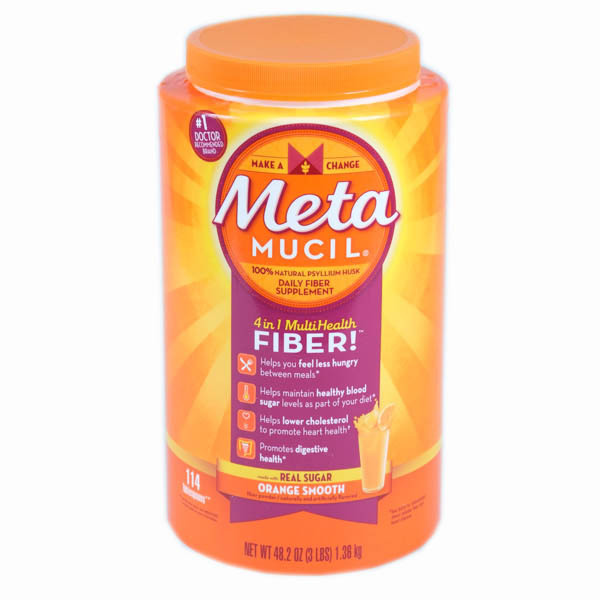 Metamucil MultiHealth Fiber received one of the highest scores on our taste test. It’s an orange-flavored powder that looks like fruit punch mix and has a texture reminiscent of a smoothie once you add water. The end result was also surprisingly tasty, with one tester reporting, “This reminds me of Tang.” if the only way you’re going to keep taking a fiber supplement is if it tastes better, then Metamucil MultiHealth Fiber is our pick. A 1-tablespoon serving gives you 3 grams of dietary fiber. In addition, the fiber is psyllium which means that it is providing clinically proven health benefits. Research has found that psyllium holds onto water in the intestines as it gels, helping to relieve constipation by bulking up the contents of the intestines. Because psyllium absorbs water, it’s also used to help relieve diarrhea. Fiber content aside, a 1-tablespoon serving also contains 8 grams of sugar. (An Oreo has about 4.7 grams of sugar, by comparison.) We were unable to give Metamucil MultiHealth our top spot due to the sheer amount of sugar it contains — sucrose appears first on the ingredient list, meaning this supplement has more sugar than fiber. 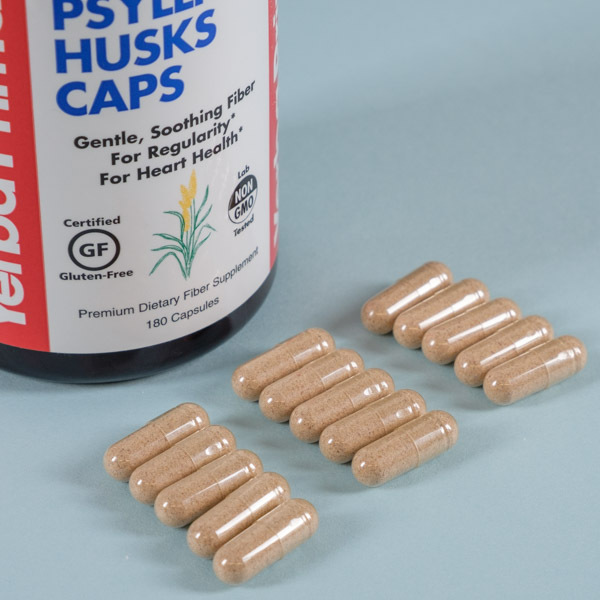 Gelatin capsules that contain nothing but psyllium. An alternative to powder, but you’ll have to swallow a lot of them. 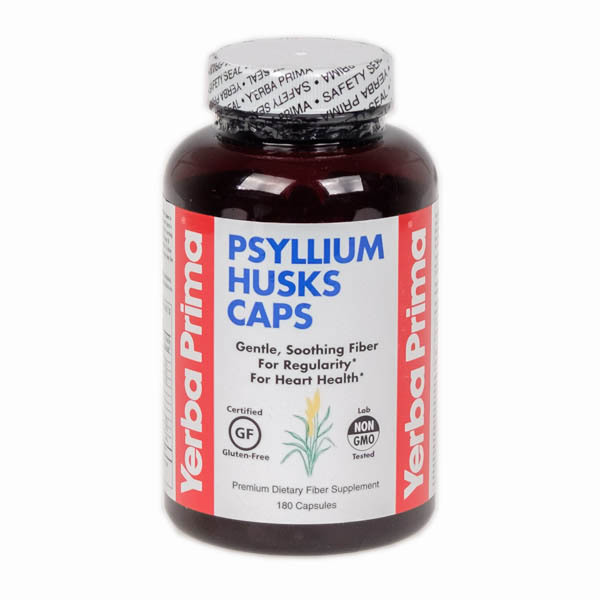 Yerba Prima Psyllium Husks Caps stood out because they had a slightly higher psyllium content than the other capsules we tested, at roughly 0.55 gram per pill, versus the 0.4 gram offered by Metamucil’s MultiHealth Capsules, or Thompson Psyllium Husks’ 0.5 gram. It’s a slight increase, but if you’re aiming for 10 grams a day, it will save you from swallowing an additional three to seven pills. We also appreciate the transparency of Yerba Prima’s label, which spells out exactly how many grams of soluble and insoluble fiber you’re getting, in addition to calling out trace elements like calcium and potassium. That said, the main ingredient is still pure psyllium, which makes up the contents of the capsule — that means you’re getting fiber from a source with clinically proven benefits. If you have strong objections to a thick, goopy texture, capsules are the way to go. 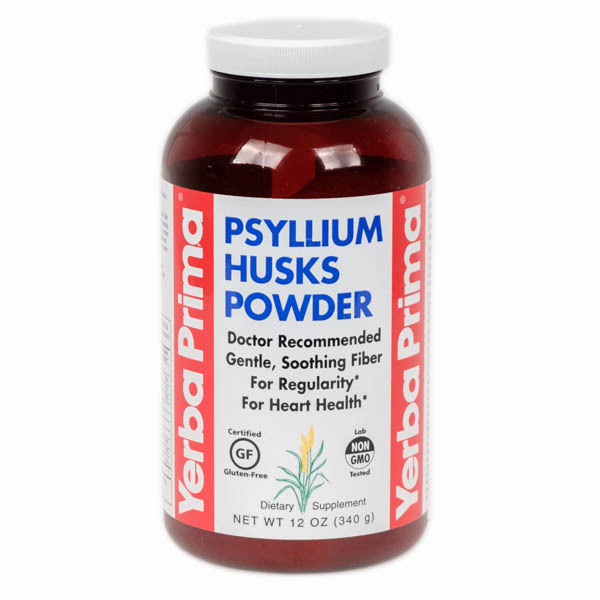 Each Yerba Prima capsule contains psyllium powder, so you are still receiving the best fiber possible. Since you take them like regular pills, that means you also get to avoid unpleasant tastes—most of the fiber supplements we tried were not popular with our taste testers. While you may get to avoid bad tastes and goopy textures, capsules have a drawback. Fiber is bulky, and there’s only so much you can fit in a single capsule. You’ll need to swallow eighteen Yerba Prima capsules a day to hit the recommended dosage of daily fiber. But for those who just can’t stand the taste of powders, the capsules are still worth consideration. It’s worth repeating that psyllium is the best fiber source. Psyllium is less likely to give you gas and more likely to prevent cardiovascular disease. But that’s not all. Like insoluble fiber, psyllium also promotes bowel regularity. It also reduces blood sugar levels in individuals with Type 2 diabetes and is proven to help you feel full longer. Many baked goods, like breads, snack bars, and even some fiber supplements use beta-glucan from oats as a fiber source. Beta-glucan offers many of the same health benefits as psyllium (though clinical research suggests it lacks the ability to normalize bowel movements). But notably, research suggests beta-glucan is more fragile than psyllium: Its ability to lower cholesterol may be reduced when it’s baked or exposed to high heat and pressure. The jury is still out on exactly how much the cooking process impacts oat fiber, but it’s one more point in favor of psyllium in the meantime. Yes, but only if they have Psyllium. The Food and Drug Administration is beginning to scrutinize less-effective fiber sources. A rule change to the Nutritional Labeling and Education Act (NLEA) issued in 2016 will require fiber supplement manufacturers to prove the health benefits of their sources of fiber in order to print health claims on labels. That rule affected much of the market, including well-known brands with “fiber” in their name, such as Benefiber, that use non-psyllium formulas but still make broad claims about the efficacy of their products.